Intermatic EI200 Series Electronic countdown timer with preset time, ensures calm and quiet operation in time ranging from 5 mins to 12 Hours. This timer with HOLD mode, is suitable for continuous ON operation. The timer with single button, is ideal for incandescent/fluorescent/CFL/LED lamps. 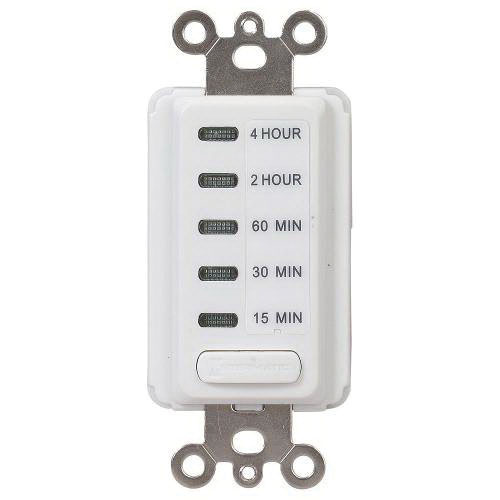 This timer with neutral connection, is compatible with decorator-style wallplate. It is suitable for use with bathroom fans, hot tubs, storage closets and garage lights. The auto shut OFF timer in white color, has a voltage rating of 120-Volts AC and power rating of 1800-Watts. The timer meets UL 244A, E211835, cULus, ASHRAE 90.1 and Title 24 standards.